We are delighted to inform you that A Place To Be is up and running again. We hope to celebrate yet another year of great creativity. 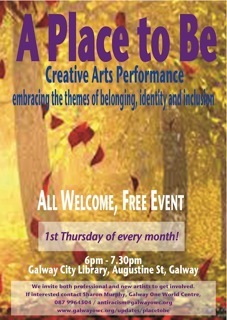 Thursday 5th Feb, 6- 7.30 in the City Library, Galway. We would like to invite all our Artists to perform (1) song or poem, share or read a short story or perform a wee dance. This entry was posted in Country, Dance, Development Education, Ireland, local / global, Theatre skills and tagged A Place To Be, dance, Poetry, Spoken Word. Bookmark the permalink.